It’s time for the Clegane Bowl everyone! Fan favorite (my personal favorite character from both the show and the books) is back: Sandor Clegane, aka The Hound, has returned. I’ll write about the implications for this a bit later but first it’s time for a quick synopsis. The High Sparrow informs Margaery that she is neglecting her marriage bed with Tommen, and that she must provide him with an heir. At the same time he makes a veiled threat against her grandmother, Lady Olenna (the Queen of Thorns) telling Margaery that if she cannot bring her grandmother into the faith her safety cannot be ensured. Margaery speaks to her grandmother and convinces her to go to High Garden, while slipping her a piece of paper. The paper holds the sigil of House Tyrell, a rose. As Olenna prepares to leave (we assume, actually she’s just writing a letter in this scene) Cersei pleads with her for help, admitting her fault in the current situation. Olenna chides Cersei and tells her that she should leave as well; Cersei decides to stay despite having no allies left (except of course for Gregor Clegane). Theon and Yara are whoring in Volantis on their way to Meereen to form a pact with Daenerys. Arya hires passage on a vessel bound for Westeros. However, she is attacked by an old woman who turns out to be The Waif in disguise. She is stabbed numerous times in the torso but falls over a bridge into the water. She survives and limps along a street in Braavos not knowing which faces she can trust. This scene comes almost directly out of the books. 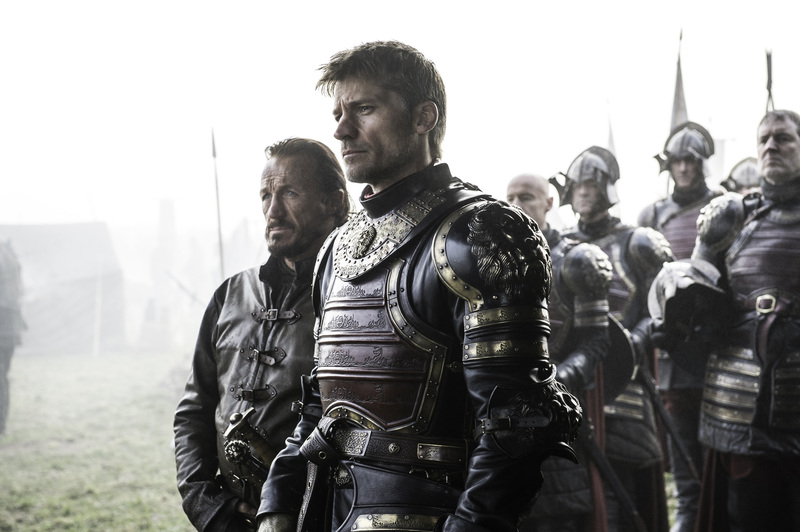 Jamie arrives at the siege of Riverrun to find the Freys failing miserably. They threaten to kill Edmure Tully if the Blackfish does not give up the keep. He refuses, and the Freys fail to actually kill Edmure. Jamie chides them, telling them that they should never make a threat they are unwilling to carry out. He then parleys with Blackfish. They realise that he will never give up the keep, and that he can withstand a 2 year siege. In the cold open we see a group of people building something out of lumber. Four men carry a log, followed by a single man carrying one. This man turns out to be The Hound. 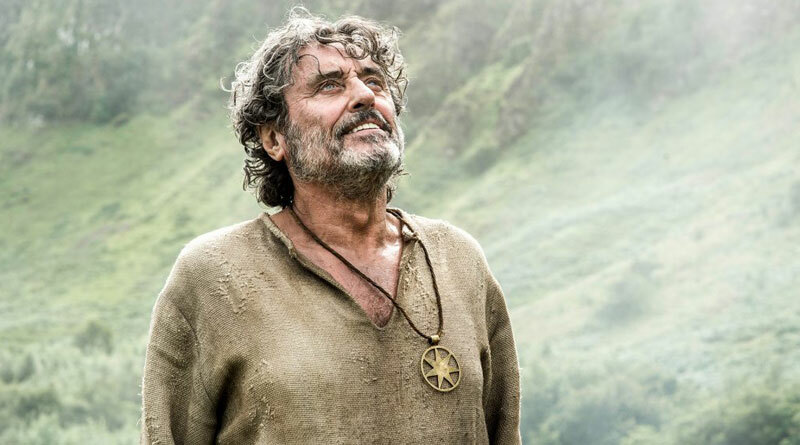 He had been nearly dead when a Septon named Ray (played by Ian McShane) found him, and nursed him back to health. Sandor expresses regret at his past and questions why the gods haven’t punished him. Ray responds that perhaps they had. Later Clegane chides Ray, telling him that they’ll come back with more men and take what they want. Ray, a pacifist, says that he will not fight. Later, Clegane is chopping wood when he hears a commotion. He finds the group all slaughtered, and Ray hanged. 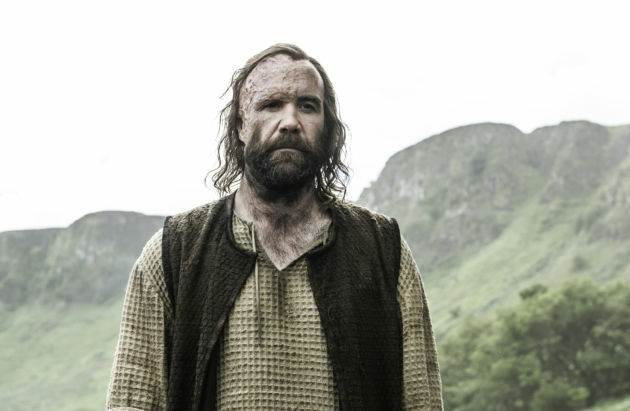 A look of rage and defeat fills Clegane’s face as he picks up the axe and marches off. Although this was another episode of pure exposition it was one of the best episodes of the season. We finally see the return of Clegane, something that has been hinted at but never shown until now. It is unclear, however, if the Clegane Bowl will happen. As a brief summary, the Clegane Bowl is the name for a fan theory that posits that Gregor Clegane (The Mountain/Ser Robert Strong) will be Cersei’s champion in her trial by combat and that Sandor will be the Faith’s champion. It is also theorized that Sandor will kill Clegane and Cersei will be executed as a result. Whether or not this will occur is yet to be seen, and I have a suspicion that something else may happen. In the books Sandor is most likely the nameless masked gravedigger Brienne encounters during her search for Sansa, and the show puts Sandor in a similar situation. He is a member of the faith, perhaps not the most religious member but he is at least repentant for his past. It is interesting to note that The Brotherhood has not, in the past, been murderers. Their duty, as led by Beric Dondarrion, is to protect the small folk. Although they are not above theft or extortion, they typically rob the rich and give to, well, either the poor or themselves. If the murderers are indeed The Brotherhood, they have taken a strange turn indeed. There are several possibilities here. First, it may be that the people who slew Ray’s flock were not The Brotherhood. Conversely, it may be that The Brotherhood has actually turned to mere bandits. Neither of which are likely. I doubt that Dondarrion would allow such behavior under his Brotherhood. 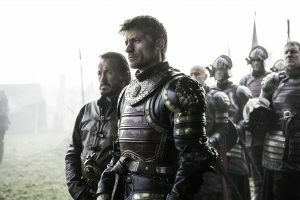 If these murderers are indeed from The Brotherhood, then it is likely that Dondarrion is no longer the leader. In the books, Lady Stoneheart, formerly Catelyn Stark, as resurrected when Dondarrion gave his life to save hers. She was risen as a cruel, merciless leader who hangs anyone who had been remotely involved in her death. 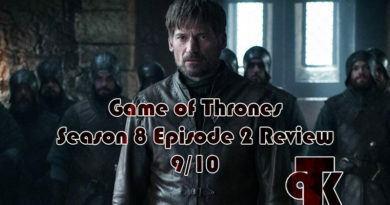 There is some evidence for this: last episode when Walder Frey was chiding his sons we learned that The Brotherhood was harassing them, something that Dondarrion had not been doing; his fight was with the Lannisters, not the Freys. Also, Dondarrion did not hang people, but Lady Stoneheart does. Whoever this “Brotherhood” is, we can surmise that Clegane will be giving them trouble next episode. Arya had an interesting, if not disappointing, storyline here. Why she, of all people, had not been taking precautions, is something I cannot understand. Either something else is going on here or it seems that the writers were not being true to Arya’s character. Jon Snow seems to be walking into his second death. He has only a few thousand men and is outnumbered by Ramsey’s superior forces. In addition, the bulk of his forces are wildlings, untrained, undisciplined and totally unprepared for a siege. The rest of his men despise the wildlings and the situation looks hopeless. Which is why, of course, Sansa writes her letter, presumably to Petyr Baelish to get help from the Eyrie’s forces. It seems like poor writing because, frankly, there’s no way Snow doesn’t realize his forces are too small to assault Winterfell. On the whole this is by far one of the better episodes, and one of only four in Game of Throne’s run to have a cold open. 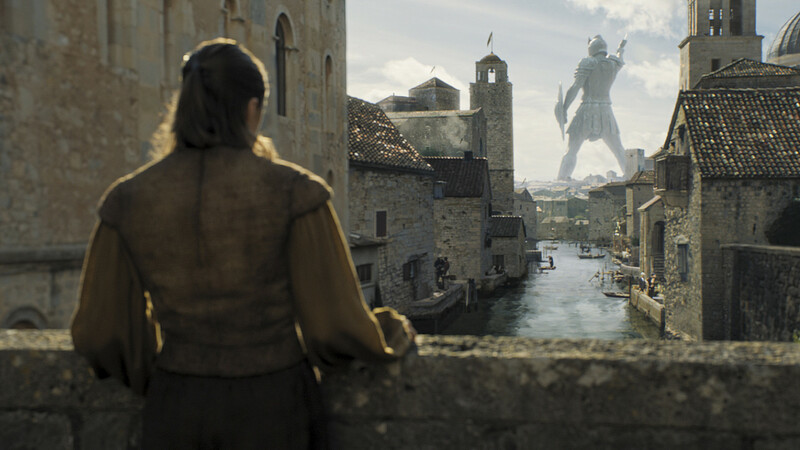 The revelation that Clegane was alive comes just before the opening credits and served to give an air of anticipation and excitement for the rest of the episode. Where last episode was a bit slow, this episode, although not particularly fast, moves at an appropriate pace for an expository episode. 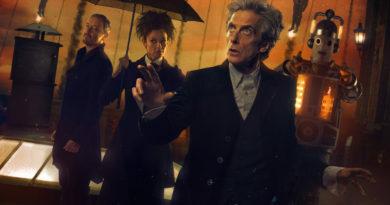 It looks like some exciting things will be coming in the next few episodes.